A pyramidal tree that is hardy and low maintenance. The branches are more closely spaced than the similar 'Autumn Blaze. The fall color is rusty orange to burgundy. It tolerates alkaline, acid, or wet soils and urban conditions. Reported to be more wind tolerant than similar trees. 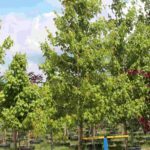 This is a quick growing shade tree, suitable for parks and large gardens.